In order to encourage good practices, we have ensured that quality across our business meets the highest certification at ISO level: covering workers’ rights, safety and environmental concerns and customer satisfaction in equal measure. In September 2015, ISO 9001:2015 was announced. We train our representatives externally in order to comply with updated regulations, and had our audit to upgrade our certification in November 2015. As the audit revealed only 2 recommendations and zero CARs, we received the upgraded certification in November that year. In January 10 2019 we were re-certified by Intertek. We are dedicated to reducing our carbon footprint and taking care of our local environment and planet as a whole. 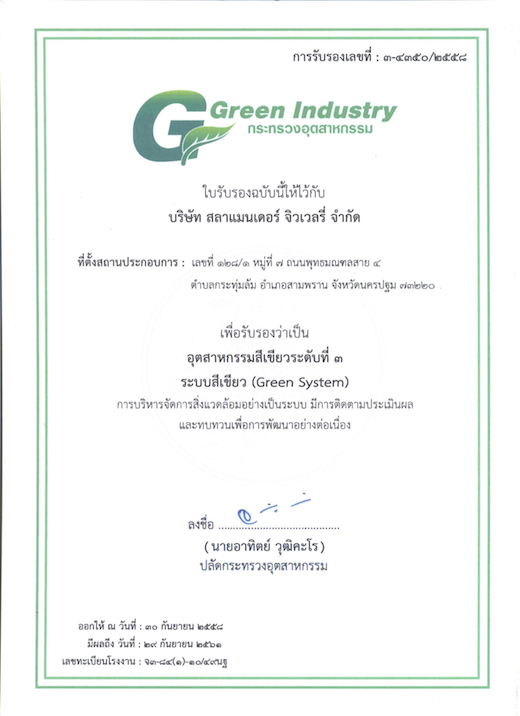 ISO14001 standards are a world-class benchmark in this regard, and on September 3, 2012, we achieved our certification. Our systems are fully capable of efficient environmental operation, from management to employees. Our customers and stakeholders can be assured that improvements to environmental impact are at the forefront of our processes now and for the future In September 2015, the requirements were updated to ISO 14001: 2015. Our committee is now working towards this and we expect to attain the new certification by September 2016. 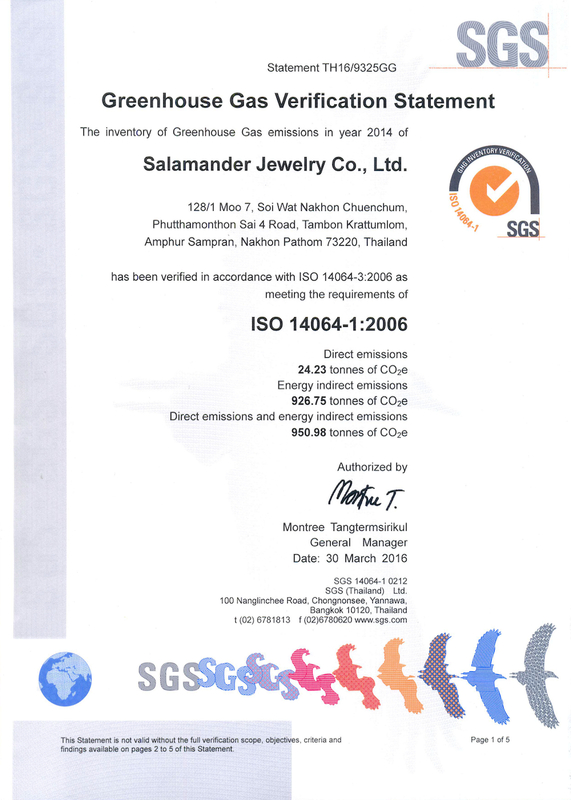 Salamander Jewelry Co., Ltd. has a policy of the commitment to maximize the usability of resource and energy in order to reduce greenhouse gas emission and encourage the employee and accessory to have knowledge about global warming and its effect, aware of responsibility to community about reduce greenhouse gas emission and take an action together. The calculation period for these 3 scopes is during January – December 2014. In order to keep within our goals of caring for the planet as much as we can, we constantly monitor our systems to ensure maximum energy efficiency, using renewable where possible and keeping our systems and equipment current. ISO50001 provides a concrete set of requirements to establish and maintain an energy management system. This enables us to keep track of our progress in this regard and constantly improve. 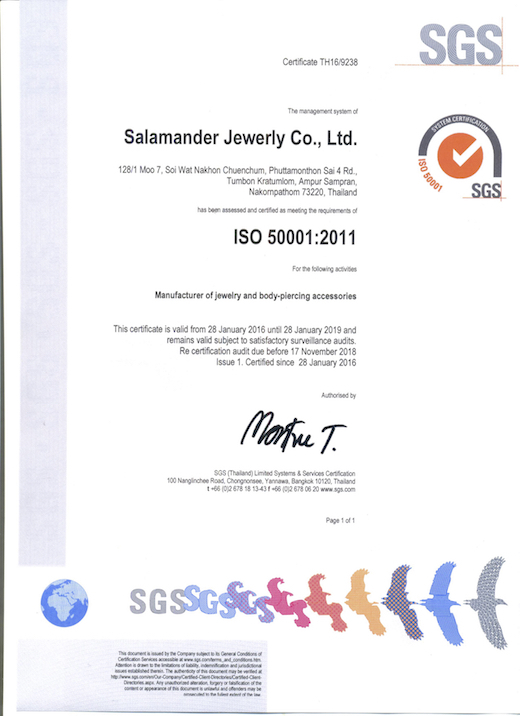 We have been ISO 50001: 2011 certified since 2012. We aim to reduce our energy consumption by 15% in 2016. Our operational summary showed an attainable reduction of 4.27% for 2015. 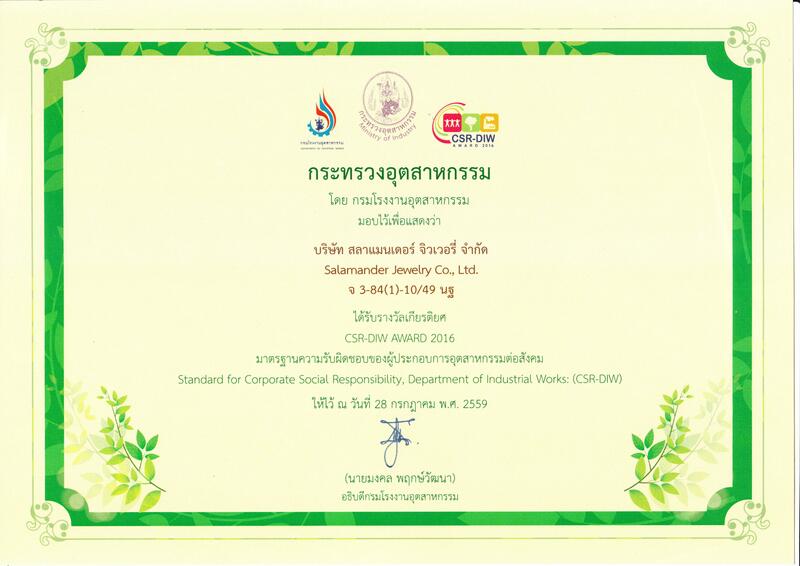 We achieved our ISO 50001: 2011 certification on the 28th January 2016. The prevalence of digital data and the risks involved to privacy are now paramount. We consider protecting our customers’ data a priority, and go to great lengths to make sure we are operating as safely and efficiently as we can be. 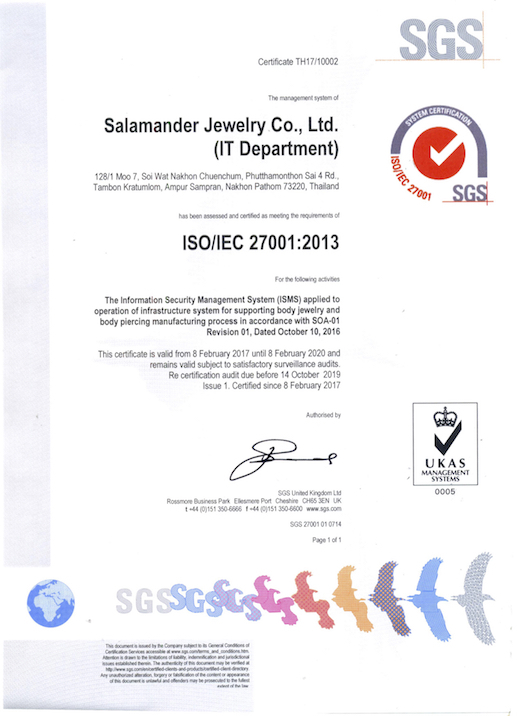 ISO 27001 standards are the perfect benchmark and we are anticipating our certification in 2016. Alongside the national legal requirements for occupational health and safety, we decided to adopt an internationally recognized standard. OHSAS18001 was built by a group of the top consultancies and certification bodies in the world. It has helped us greatly in maintaining our exemplary health and safety record, and sets a very high standard for our management and committees to contribute towards. 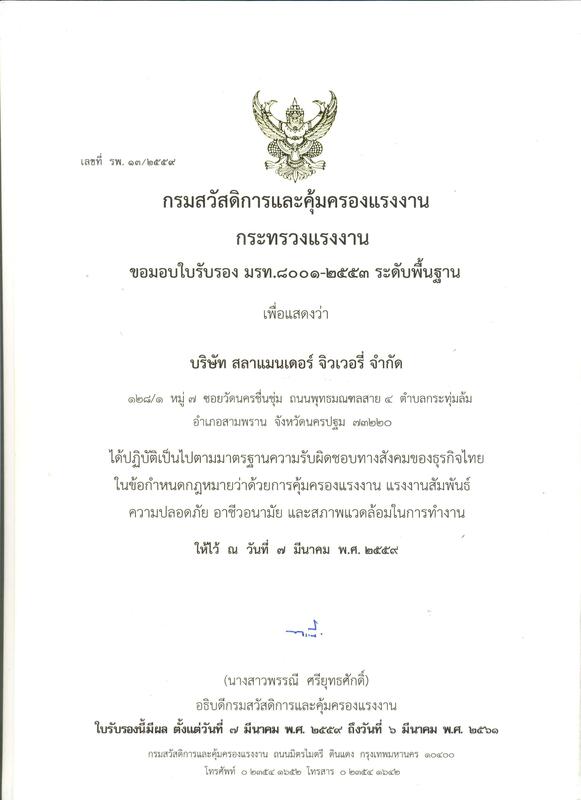 With hard work from our team we achieved our certification on September 17, 2012. In 2016, ISO will adopt ISO 45001 as their universal standard to replace OHSAS 18001: 2007. Our committee is studying the new regulations and expects to attain this certification in October 2016. 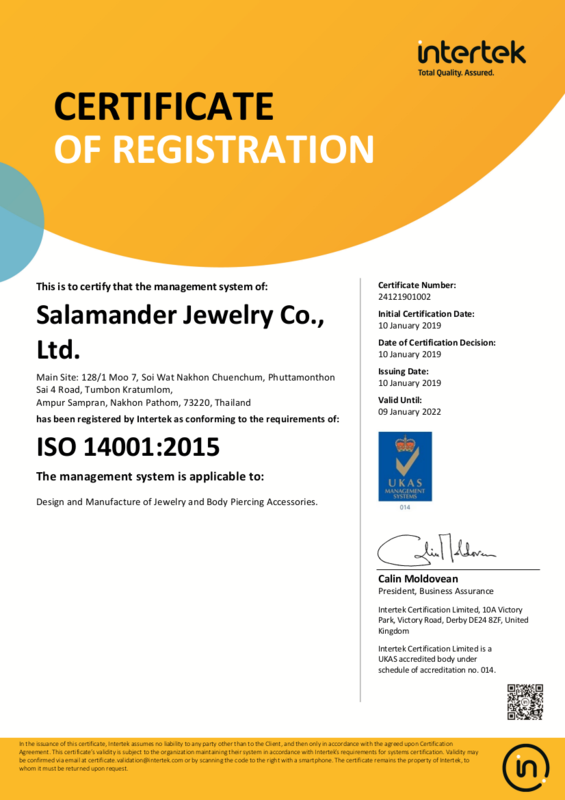 Salamander Jewelry Co., Ltd. is member of SEDEX, which has an ethical information exchange system for manufacturers and distributors in the industry. 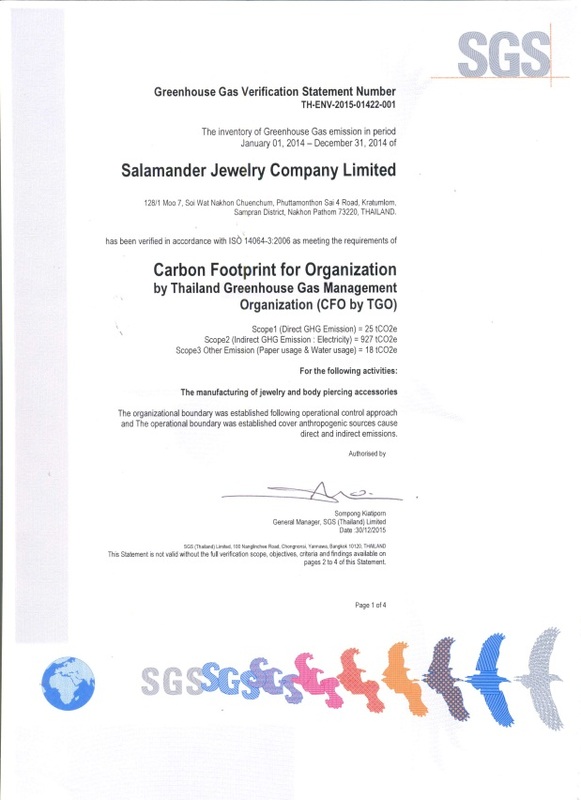 We have been investigated by members of SEDEX together and in accordance with SMETA certification guidelines. The audit was conducted at the beginning of March 2017. Carbon footprint We’re committed to resource and energy efficiency, to reducing our greenhouse gas emissions whilst spreading knowledge to our workers and associates about the importance of looking after our planet. The modern climate is changing, and we feel it’s vital to operate with this in mind, and encourage awareness every step of the way. Together we can make a difference. The carbon footprint is one key way of measuring the potential environmental imbalance caused by our actions. The definition of a carbon footprint is "the total sets of greenhouse gas emissions caused by an organization, event, product or individual."